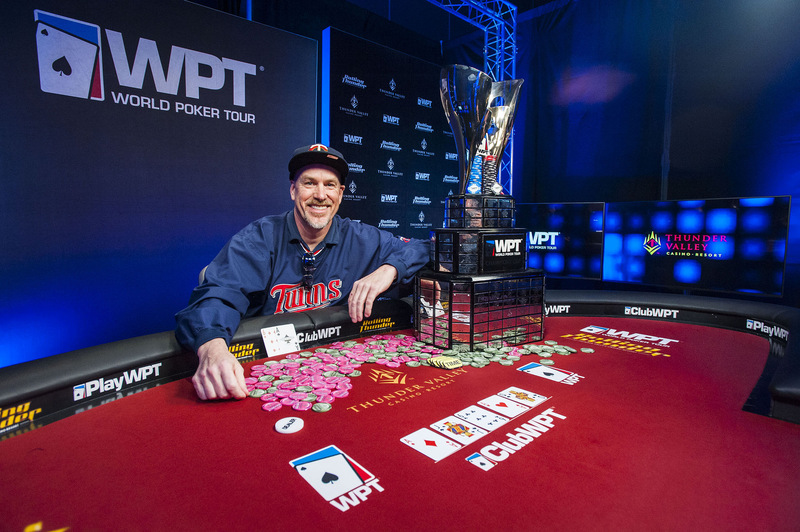 David Larson beat Ian Steinman heads-up to win the World Poker Tour Rolling Thunder event (WPT photo/Joe Giron). In the days leading up to the World Poker Tour Rolling Thunder event at Thunder Valley Casino in Lincoln, California, David Larson was playing mega-satellites trying to get into the Main Event. He stone-bubbled one, walking away with $2,000 in cash. He decided to use that money to buy-in directly to the $3,500 buy-in event. Good decision. Larson outlasted 439 other players to win the WPT Rolling Thunder event for $295,128 and now finds himself preparing to play the WPT Tournament of Champions this May in Las Vegas. Larson took care of the first elimination at the final table. Down to just 12 big blinds, D.J. Alexander moved all in from UTG and Larson called from the button. Alexander showed while Larson turned over . The board ran out to eliminate Alexander in sixth place. Five-handed play continued for over 3.5 hours but during that time, Ian Steinman and Joe McKeehen, the two biggest stacks at the time, clashed in a hand that left many fans watching at home shaking their head in disbelief. Action folded to Steinman in the small blind and he raised to 160,000 with and McKeehen called from the big blind with . After the flop, Steinman bet 150,000 and McKeehen called again. The turn was the and Steinman check-called McKeehen’s bet of 370,000. The river was the and Steinman bet 800,000. McKeehen announced he was all in for 2,940,000. Steinman used six of his time banks before folding. Steinman regained some of those chips when he eliminated Rayo Kniep some 30 hands later. McKeehen raised to 200,000 from UTG, Kniep called from the small blind and Steinman called from the big blind. The flop got all three players to check. The turn got Kniep to check, Stienman bet 255,000 and McKeehen folded. Kniep moved all in for 1,100,000 and Steinman called. Kniep showed but got bad news when Steinman tabled for trip tens. The river was the and Kniep was sent to the rail. Five hands later, Steinman busted another one. Ping Liu moved all in from the button for 1,415,000 and Steinman called from the small blind. Liu showed but found himself dominated when Steinman showed . The flop changed nothing and Liu could only watch as the turnand river sealed his fate. Despite having held the chip lead at multiple times during the final table, McKeehen couldn’t carry that momentum to his first WPT title. McKeehen raised to 250,000 from the button, Larson called from the small blind and Steinman folded his big. After the flop, Larson fired 400,000 into the middle only to have McKeehen move all in for 1,320,000. Larson called and showed for the nut flush draw while McKeehen tabled . The two-time WSOP bracelet winner picked up extra outs on the turn but was eliminated after the river failed to connect. Heads-up play began with Steinman holding 8,500,000 million of the 13,100,000 million chips in play. Larson took the chip lead for the first time just five hands into heads-up play though and after 24 hands of play between the two, he finished Steinman off. Larson raised to 375,000 from the button before Steinman made it 1,100,000 to go. Larson called to see a flop. Steinman check-called Larson’s bet of 400,000. The turn was the and both players checked. The river got Steinman to bet 500,000 and Larson responded by moving all in. Steinamn called off his last 1,000,0000 and showed but got the bad news as Larson tabled for a full house.